Beautiful city scenes in a charm-your-socks-off story about a pup who learns how lucky he is. He’ll remind you always to look on the bright side of life. 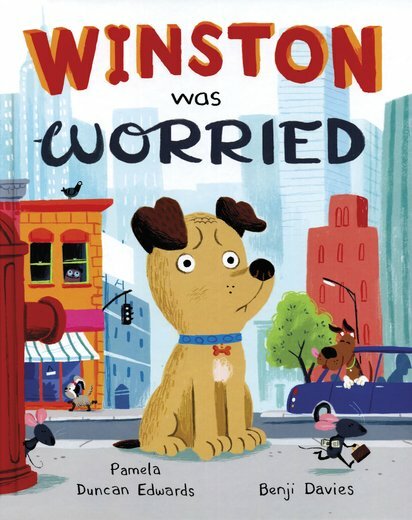 When this story starts, Winston is feeling very unlucky. He has a big, painful splinter in his paw. There’s no playing with friends for Winston today. Instead, he has to hobble across town to the vet. Thing is, that pesky splinter is such a bother that Winston doesn’t look behind him. If he did, he’d know that he’s actually the lucky one… So sweet, so witty. We love this not just for its charming hero (ahhh), but for the amazing art showing every step of Winston’s journey through the big city. I liked because Winston was to busy worrying about his splinter in his paw and didn’t notice worse things were happening to his friends.